So the picture below gives you a "taster" of what could be a regular scene on the Boyne canal when the Restoration group have progressed their work a little further. 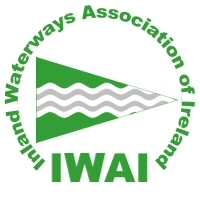 Yesterday members the IWAI Powerboat branch took a spin us from Drogheda as far as the restored Oldbridge Lock. All comers were "fed and watered" by the very capable "catering Branch" of the Boyne group(thank you Ladies), then Tommy McLoughlin gave us a fantastic overview of the project to-date and his vision of what might happen in the future. When sufficient sustenance had been taken on-board some took lake boats and others travelled the few minutes by road to the Oldbridge house (Site of the Battle of the Boyne and interpretive centre). Notwithstanding that I have been hearing for years of the great work carried out by the Boyne branch it was only yesterday that I saw for the first time "in the flesh" the visionary work that is being done on that site. It does not take a great leap of the imagination to see how the new Marina initiative (announced for Drogheda on Saturday) coupled with minimal marking of the shallows on the Boyne river and the opening of the Oldbridge section of the canal right up to the interpretive centre could become a very worthy tourist attraction in a very short period of time. I know that Tommy would say that is too modest an aspiration and he could easily see it opened as far as Newgrange and beyond, but that first section is indeed a very achievable goal with real visitor attracting potential in a short timescale. I wonder is this the first ever Jetski to enter a Lock of the Boyne navigation ???? Part of the PB Branch Flotila being led up from Drogheda with Tommy showing the way in the lead boat. Base of the new MI Motorway suspension bridge in the backround.